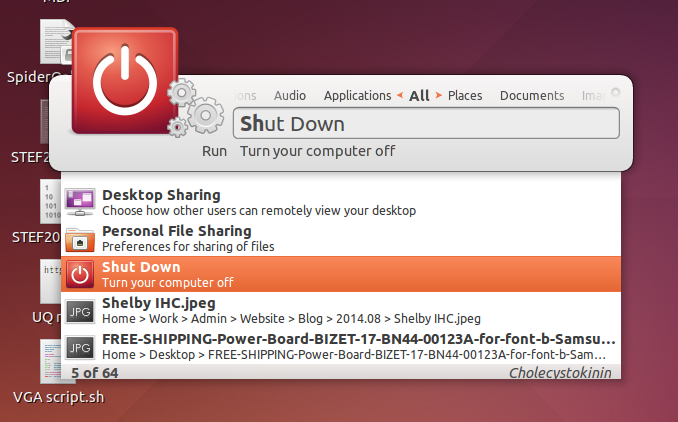 Install Synapse on Ubuntu 14.04 | goFLOSS! Synapse is an amazing little tool that I now systematically install when I have a fresh version of Ubuntu on my computer. It allows the user to search very quickly for an app to launch, a file to open or even to search something on the Internet. I find it to be a lot faster than the Unity dash. Synapse recognise the closest matching result even if you inadvertently mash the keyboard with your fat fingers. Synapse also lists other results that match your search. Just navigate through them with the keyboard arrows. Many have noticed that Synapse was removed from the official repositories when they upgraded to 14.04. This has already been reported on Launchpad. Thankfully, it is rather painless to find the right package. Some people have figured out that the Ubuntu 13.10 package (synapse version 0.2.10-2ubuntu3) works well on the latest LTS version of Ubuntu. I tested both 32 and 64 bits versions without any problem. Make sure you download the right .deb package at the bottom of this page according to your architecture: if you are not sure, got to “cog icon > about this computer” and pick amd64 if you see “64 bits”, or i386 if you see “32 bits” under “OS type”. Make sure you tell synapse to “startup on login” in its preferences so you can invoke it any time with the keyboard shortcut “ctrl + space” (which you can modify if you want to). I also un-tick “show notification icon” as it is not very useful (and as the icon does not fit the grey style of the other indicators :) ). ← Happy 10th birthday, OpenStreetMap!